Researchers from Japan's Advanced Institute of Science and Technology (JAIST) and the University of Southampton in the UK have developed a new way to fabricate ultra-fine graphene nanodevices using helium-ion microscopy. Usually this tool is used for sub-nanometer probing and high-resolution imaging, but this time they have used to it to selectively sputter graphene to create intricate nanoscale designs. The researchers used their new technique to develop two devices: ultrathin suspended graphene nanoribbons for extremely sensitive gas molecular sensors and densely integrated graphene Quantum Dots for quantum information processing technologies. The idea is to first use EB lithography to pattern metal contacts onto the graphene flakes and then use the helium-ion-beam milling process to carve graphene into ultrafine structures (such as nanoribbons and QDs). It's vital to completely clean the graphene surface and remove the EB residues before the milling. 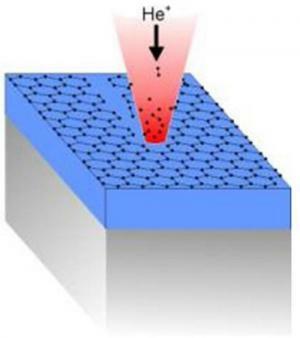 Back in November 2012, AIST researchers used he-ion beams to control the electrical conductivity of graphene by introducing a low concentration of crystal defects on a graphene sheet.